Butlerz offer premier dry cleaning services. Our company ethos is to look after our customers by providing a great door-to-door service and offering our customers the full range of dry cleaning services for the busy home. One of these services is our very popular wax and suede cleaning and re-proofing service. We clean all wax and suede clothing but its the wax and suede jackets that we clean the most. This is because these are for outdoor wear and an item that should last for years, however, they will naturally get dirty from regular use and from winter weather conditions. What is Wax Jacket Reproofing? Wax reproofing for your wax jacket or suede item is vital to bring your garment to life and should be carried out at least once per year. Wax jackets should never be washing machine to avoid removing the wax coating and to avoid permanent damage. Using a sponge and cold water, carefully wash the outer layer of the jacket. Ensure hot water or soap is NOT used. Before using any sort of wax, it must be softened. Place the wax tin inside a container to soften for approximately 20 minutes before the wax is liquid in consistency. Using a sponge, use the liquid wax and work in to your jacket, giving careful attention to details such as seams, creases and dry patches. Any excess wax that has been used should be wiped off using a cloth. Ensure your wax jacket avoids the collar, the inside of the jacket and pockets which are made of corduroy materials. Reproofing and cleaning your wax or suede garments at home can be challenging and time consuming, and without the correct care, your garments could be susceptible to lifelong damage. Having your wax and suede jackets professionally cleaned and reproofed is highly recommended to ensure a pristine, high quality finish. 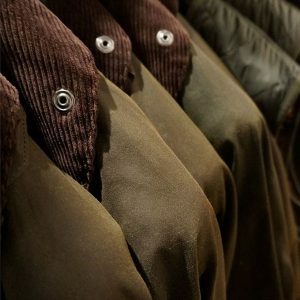 We are able to clean and re-proof all wax jackets brands including the iconic brand Barbour. The Barbour wax jacket is the cotton wax jacket made famous by its water-resistant outer layer made with a paraffin-based wax. Its style is very recognisable with its usual tartan lining and a corduroy or leather collar. Waxed cotton jackets are doubly waterproofed because the outside is treated with the waterproof coating plus individual threads of the cloth are impregnated with wax before the bolt is woven. This is why these types of jackets are made to last and by having them cleaned and re-proofed with experienced dry cleaners such as Butlerz they can last you a life time. Suede leather is still made from leather but it is the underside of the animal skin primarily made from lamb, goat, calf or deer. When manufacturers make suede they usually take the grain out in one piece. They grind the surface of the skin side down using an emery wheel so that it features a consistent texture and thickness. Because suede does not include the tough exterior skin layer, suede is less durable but softer than standard full-grain leather. This treatment means that the fabric tends to be softer, thinner, and more pliable than standard leather. However, due to its texture and porous nature, the material is highly susceptible to wear and tear. But its a material that if looked after properly will maintain its shape and look like new so its worth looking after it. Maintaining suede appropriately no matter whether its shoes, gloves, coats will keep it in great shape, just as with normal leather. Cleaning will rid the materials of dirt and stains and will revitalise the clothing. Wax jackets have the potential to develop an odour from the wax treatment and our process of cleaning will rid it of any body odours. Once cleaned and using only the best cream protectors and sprays to protect the suede and cotton plus wax materials, it is possible to keep clothing looking like new for years, even a lifetime. 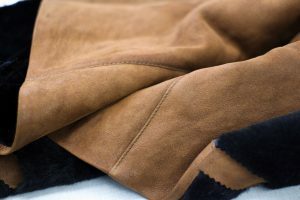 At Butlerz, we have years of experience in wax and suede jacket reproofing and cleaning and are even able to offer wax jacket repairs in Surrey, Hampshire and Sussex areas. We offer a FREE wax and suede cleaning and reproofing collection and delivery service which covers a wide field of locations across the borders of Surrey, Hampshire and Sussex including Haslemere, Farnham and Godalming. Take a look at our full service area. We also offer a safe and reliable postal service for those who live outside of the collection and delivery area and still wish to make use of our specialist dry cleaning services. Why not call us to discuss your specific wax or suede garment requirements on 01428 713026 or 07866443116 . Alternatively, you can drop us a message via our contact form.